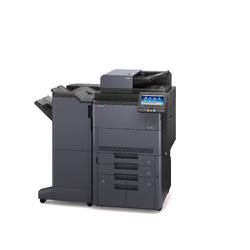 Our new TASKalfa 7052ci MFP is the perfect choice for all demanding workgroups and production offices. From its fast overall performance to the advanced paper handling options and a maximum paper capacity of 7,650 sheets, there’s not much left to be desired. Print quality is astounding: The TASKalfa 7052ci prints at 1,200 x 1,200 dpi, delivering highly detailed results even at highest print speeds. The new and advanced toner enlarges the colour gamut, producing the most vivid and vibrant colours. Additionally, the redesigned 9″ touch panel makes accessing all features very intuitive and easy to use. Posted in Colour Multifunctional Devices.